This page was last updated on April 07, 2019. 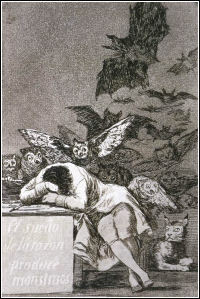 "The Sleep of Reason Produces Monsters" is from Goya's 1799 Los Caprichos series. Its title sums up why sites like this one need to exist. This site is owned and maintained by Peter Bowditch. My email address for correspondence about this site is . Please note that this email address can change occasionally without notice if it receives spam; it is only used for correspondence from visitors to this site, should only be accessed by clicking a link and should never be stored in any address book. John Lennon once said "Living is easy with eyes closed, misunderstanding all you see". I don't want to live with my eyes closed, so I choose to be a skeptic. I like my facts to be correct, and I don't like the things that I know to be things that ain't so. I think that irrational beliefs breed further irrational thoughts and it is too easy to go from UFOs or Elvis sightings which waste time to gurus and NLP preachers who waste money through to crazy medical and health beliefs which waste lives. The main focus of my skeptical activities recently has been fraudulent medical practices, but this is just a specific example of the rejection of reason and, as it happens, one of the examples with dangerous consequences. In real life, before I retired to the country I used to work for an IT consulting company and do casual teaching at TAFE. I am an exemplar of the baby boomer generation in terms of age, family structure and past indiscretions. You can find out even more secrets about me at peterbowditch.com. Sources of the various artworks appearing throughout this site can be found in the Art Collection section. The words under the masthead on the front page are from Bob Dylan's song "A Hard Rain's A-Gonna Fall". You can see the full words of this song here. When I display cartoons here I always try to acknowledge the artist and link back to the relevant web site. Sometimes, however, I come across them in places where no origin or artist can be determined. In these case I apologise to the artists involved and say that if anyone can tell me who created the works I will give full credit. This web site was created in March 1999 when I discovered that one of the most offensive (to me) sites on the Web had been reborn with a new domain name. I felt that there was a need to be rude to some people. The constant misspelling of the word "millennium" with only one "n" inspired me to create a millenium - that is, a collection of a thousand arseholes. I should point out that I don't want these sites removed from the Web, although I would not be sorry to see many of them disappear. I have a total commitment to free speech, even if I don't like what people say. Also, I may be accused of delivering publicity and attention to these places. A commitment to free speech requires a knowledge of the limits to which it can take us, and getting that knowledge sometimes forces us to look at things we would rather ignore. Images like the one at right, linking to the EFF's Internet freedom of speech campaign, appear on many of these sites as the owners claim their legitimate right to express their views. I hope, but do not expect, that they will extend to me that same privilege when I call them arseholes. Owners of sites linked to from here may be offended and feel that I am holding them up to ridicule by calling them arseholes. Good. If they wish to send me messages telling me of their displeasure, I will publish them here. If they request that the communications be kept private, I will ignore the requests and publish the messages anyway. If they get really insistent on privacy, I will publish the messages here and also send them to social media, newsgroups and mailing lists. Similarly, all communication from lawyers will be given the widest possible distribution, including relevant bar and legal associations. Written complaints will be scanned, published here and elsewhere, and otherwise ignored. All comment on this site is my personal opinion - you may or may not agree with me, and you may or may not want to email me with your own comments - it's a free speech world, thankfully. I am open to legitimate objections by people who claim that their sites are listed here unfairly because I misunderstand what they are doing or saying. Reasons need to be provided - simply telling me I am wrong is not enough. I will consider such objections, investigate where I think fit, and then take whatever action I feel is appropriate. The choice is mine. Owners of sites listed in The Millenium Project are free to complain about being here. This site is, after all, about what I don't like and so constitutes opinion. I will only accept an objection if the person making the claim is polite and if I think that there may be some validity to their claim. Simply telling me I am wrong or stating that some researcher has proved the end of conventional science or medicine will not be sufficient, so anti-vaccinationists and creationists need not bother. Realistically, the only things likely to be considered are unlikely medical products or treatments that are actually undergoing clinical trials, although I will accept cases where a formal application has been made to the Australian Skeptics' $100,000 Challenge. ("Formal application" means forms filled in correctly, submitted and accepted. I will check. Don't tell me how you could beat the challenge if you wanted to, or that you already have and the Skeptics have not paid or any of the other 1001 excuses.) Click on the cheque for details about how to apply. Objections will be added to the collection of comments about the sites listed here. This means that anyone visiting The Millenium Project who clicks on a link to one of the sites for which an objection has been lodged will be taken to a page which mentions the complaint and shows any correspondence between me and the complainant as well as any comments I may have made. If someone can convince me that their site should not be listed here at all I may still include it for a while together with my apology. Please note that I will only entertain objections from people who actually own the sites in question. If you don't like what I say about someone else's site feel free to complain but the complaint may be treated differently. The policy across the RatbagsDotCom sites is to reproduce any critical emails sent to any email address associated with me or this site, and also to reproduce any critical discussion of me or my activities which I see or become aware of on mailing lists, Usenet newsgroups or any other outlets in any form of media. The solution is simple for anyone who does not want to see their words published here - be quiet. Threats of violence will be published with full identifying information and will be reported to relevant law enforcement organisations and Internet service providers. With more than 1000 links on this site and the changeable nature of the web, it is almost inevitable that there will be some broken links here somewhere. A checking program is run every month to identify broken links. The problems fall into two areas - pages which no longer exist and sites which cannot be reached. For a missing page, I have a look to see if the author has just renamed it or moved it. If I can't find it, it is removed from the list here immediately. Unreachable sites are more of a problem because there are a number of possible explanations - site getting updated, moving to another ISP, nuked because an ISP doesn't like it, forgot to pay for hosting or domain registration, etc. It seems that there are about 30 of these at any time and I give them three chances. If they remain unreachable after three monthly cycles they get dropped. Some sites come and go on a regular basis as they offend one ISP after another, but they stay in the list if they keep reappearing. The content of this site is opinion. It is my opinion, and if it does not match yours then that is too bad. Some people seem to be very frightened by my opinions, although I cannot understand why this should be so. If they have businesses or beliefs which are threatened by what I say on a web site which attracts a number of visitors each month which is only a minute proportion of the hundreds of millions of Internet users, then perhaps they need to think about how strong those businesses and beliefs are. The second matter is that, because this site is an expression of my opinions, I will publish opposing opinions. From the first day this site appeared it has contained a statement that any criticism may be published here. It is not my problem if people (some claiming extensive and sophisticated research skills) have missed the warning. It was there, and the choice to write was always (and will remain) up to the writer. If you want privacy, don't write. The only people who would be expected to complain about the contents of this site are those whose beliefs or practices are criticised or exposed by the information here. My ISP and I receive the occasional complaint about this site, and I suppose I would be disappointed if this were not so. Anonymous complaints are ridiculed, laughed at, mocked and ignored. Complaints from real people are read, filed, published on this site and ignored unless evidence is offered of inaccuracy in something appearing on the site. Letters from lawyers (there has only been a very small number of these) are photocopied, read, filed, published on this site and ignored, again unless evidence is offered of inaccuracy in something appearing on the site. Details of Cease & Desist orders or any other requests by lawyers for the removal of content from this site are submitted to the Chilling Effect Clearinghouse. I could not ignore a court order, just as I could not ignore winning $20 million in the lottery (a much more likely event). Of course, anyone initiating court action would not want to have called me rude names, used twenty different identities, pretended to be me or threatened to harass my clients, otherwise they might look a bit foolish to the judge. I have no desire to publish inaccuracies, but unless it can be demonstrated that something is clearly in error material will only be removed from this site upon the direct instructions of a court having proper and enforceable jurisdiction. Please note that the policy here is to NEVER settle without going to court, and any legal action will be given wide and embarrassing publicity. Do not threaten legal action in the hope of getting a reaction favourable to you in advance of court proceedings or you will be disappointed. Only one threat against this site has ever made it into a court and in that case the settlement required the complaining organisation to pay its own not insignificant court costs. People who want to waste their time complaining to government regulatory authorities about any of the RatbagsDotCom sites should contact the Australian Communications and Media Authority. Details can be found under the heading "Online services content regulation". The use of anonymising services to send email tells me three things about the senders. The first is that they are prepared to lie, because they are already indisputably lying about their names. The second is that whatever they have to say is worthless, because they do not even believe in it enough themselves to put their names to it. The third is that, because it is impossible to reply to the messages, they show that they are frightened of engaging in debate. Because of this, I will periodically declare a moratorium on receiving anonymous mail. Messages coming from email addresses which do not allow a reply or which do not originate at a traceable IP address may be deleted unread. This doesn't mean that people cannot write from Hotmail or Gmail, for example, but only applies to anomymiser services. I get sick of wasting my time on lying cowards who are ashamed of what they have to say. When the filter is on, they can talk to someone else, because I'm not listening. Several pieces of software are used to manage and maintain this site. Web host software is Apache/2.2.15 running on Unix. Microsoft Expression Web 4 is used for overall site management and editing individual pages. People keep telling me about better programs but Expression Web does what I want (as did FrontPage before it). Where any server-end functions are required they are written in Perl or PHP. An Access 2016 database holds all the information about the listed sites plus a lot more information used to maintain the site. Access writes out files that Expression Web uses to build all the various listing pages, the book shop pages and many other features across the site. Ipswitch WS_FTP 12 is used to transfer the pages to the server. This program allows both transfer of single pages and a semi-automated process that transfers all changed pages in a batch. It also runs automatically each night to collect visitor statistics. The software used for analysis of visitor statistics is WebLog Expert. Image processing was done with Corel Paint Shop Pro X2 and its predecessor for many years. For various reasons, Adobe Photoshop has taken its place. Link checking is done using Xenu's Link Sleuth. Not only does this do an excellent job of finding broken links, but it produces a file that Access can read to update the links database, and, as an added bonus, using Xenu is a way of sneering at the Cult of $cientology. Podcasts are built using Adobe Audition. For many years videos on this site were played where possible from YouTube. As part of a rebuilding of the site in early 2017, all videos are now served from the server hosting this site. This was done because of the unpredictability of YouTube when faced with copyright claims, even when those claims had no basis in fact or were submitted by anonymous people using obviously false names. Attempts to correct the unjustified removal of videos are met with a vicious circle of lodging an objection and then being sent back to the same web page to lodge the objection again. There is no way of contacting YouTube by email. I have had at least three videos removed, one following a copyright claim by the faith healing fraud Benny Hinn (the video was made by a friend of mine and did not include a single pixel connecting it in any way with Hinn) and two where the copyright claim was made by someone using an obvious false name and claiming to act for two different TV networks on the same day. I have been told that any further "infractions" will result in the immediate cancellation of my account. One of my friends had his entire account cancelled despite the fact that when YouTube opened an Australian office he was invited to the opening and given a free video camera. I could no longer take the risk that links to YouTube videos could be broken without notice, so all the videos are now here. To minimise the chances of people hunting me down for copyright violations, no videos on this site are indexed by any reputable search engine. Also, nobody can show any of the videos here on any other site by simply linking. Style sheets used comply with CSS Level 2 specifications, with the exception that some Internet Explorer users will also see differently-coloured scroll bars at the side and bottom of their screens. Also, some text may be a little larger on screen for users who do not have the "Courier New" font installed. As it has been a standard font for all Windows and Macintosh versions for the last few years and is also a part of most Linux distributions, I am not going to worry about this too much. The only information about visitors to this site which is examined or kept is that which is provided voluntarily by someone sending email to the site owner. As noted under our Email Republication Policy, we may publish any email sent to this site. We will not sell or provide any details obtained through this site or through any other of our activities to anyone unless ordered to do so by a properly constituted court with appropriate jurisdiction. The only time web server logs are looked at is when it is necessary to do so to solve site management problems. The traffic recorded in the logs is not analysed in any way except to produce consolidated statistics such as numbers of visitors and page displays. (The software used for the analysis is WebLog Expert). The majority of this work is licensed under a Creative Commons Attribution-Noncommercial-No Derivative Works 3.0 Unported License. Attribution. You must attribute the work to Peter Bowditch and provide a link to the original material (or show a URL if the reproduction is in a medium other than the world wide web). For more information about Creative Commons, please click the image at left. Authorisation to mechanically or electronically copy the contents of any material published in Australasian Science magazine is granted by the publisher to users licensed by Copyright Agency Ltd. Creative Commons does not apply to these pages. You can click on the button below to make a donation towards the running costs of this site. Not all of the money will be used for that, because I will pass on 5% to each of the organisations listed below to support their research into childhood diseases.